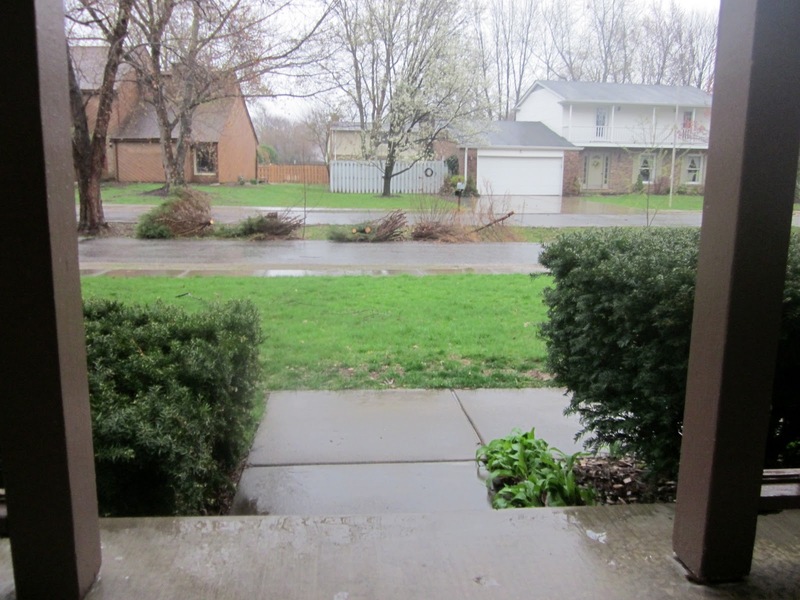 Yesterday the arrow experienced his first Indiana spring thunderstorm. Oh, sure, he's lived through (and slept through) plenty, but this was the first time he really noticed the thunder and the lightning and asked me what was happening outside. Big thunderstorms are a part of life here in the Midwest throughout the spring and summer. I've always loved watching them roll in from the comfort of a porch, hoping that they don't bring with them destructive tornadoes. Luckily, this one was relatively calm. We stood by our back window and watched the light flash, then waited patiently to hear the thunder. Someday, I'll explain to him the difference in the speed of light and sound and how you can tell how far away the storm is, just like my parents explained to me. When the worst had passed, and the rain was still pelting the yard, I let him onto the front porch to try out his photography skills. I don't usually let the arrow anywhere near my camera (it is one notch down from the cell phone in terms of tempting yet forbidden items around here). But Go Explore Nature is hosting a linkup this week called Give a Kid a Camera, encouraing kids to take some pictures of nature. So while I didn't let him get very far with the camera, I did let him snap a couple of photos himself. Before retreating inside, we both noticed his little wet footprints on our cement porch. 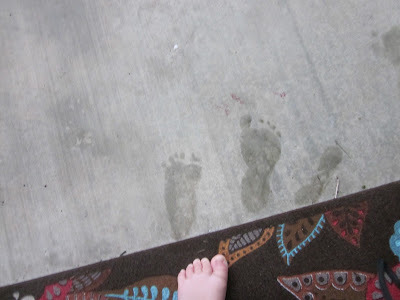 It reminded me of those newborn footprints you often see in baby books. He was totally fascinated by it, and even more excited to see it captured on the camera's screen. Go visit Go Explore Nature today to see what other nature-loving kids captured. Thanks to Debi for such a fun idea... I don't think I would have taken the arrow out in his first storm otherwise, and we definitely made some special memories. I love it! Thanks for joining up - you were the first official entrant EVER. You rock, mama!